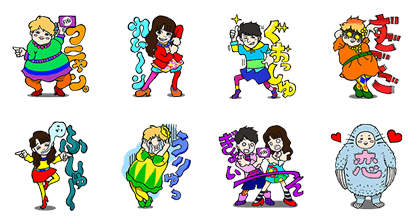 http://www.line-stickers.com/ – Fitʹs Chew and Funyan Pose Line Sticker | Chew and do the Funyan with these new stickers from LOTTE Fitʹs! All the characters from the popular commercial are gettingʹ down! Friend LOTTE Fitʹs official account to get them. Available till October 6, 2015. Copyright : Copyright © LOTTE Co.,Ltd.